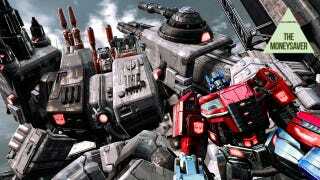 A combo pairing Transformers: Fall of Cybertron with its predecessor leads our list of 60 bargains, 35 of them digital downloads and, as usual, most of them available from online retailers. NCAA Football 13 is down to $40 about a month after its release, and the PlayStation Move game Sorcery is just $14.99. Appropriately enough for August, Kane and Lynch 2: Dog Days is in the bargain bin at $7.99. • Crysis Maximum Edition is $7.49, save 75 percent. • The First Templar is $8.06, save 73 percent. • The Secret World is $24.99, save 50 percent. • Might and Magic: Heroes VI is $26.71, save 47 percent. • Monster Minis Extreme Off-road is $3.99, save 50 percent. • Guy vs The Wicked and Nefarious Land is $3.34, save 33 percent. • Evil Genius is $4.00, save 60 percent. • Lords Of The Realm - Royal Edition is $2.40, save 60 percent. • A Game of Thrones - Genesis is $19.99, save 50 percent. • Confrontation is $19.99, save 50 percent. • Total War: Shogun 2 is €10.18, save 89 percent. • Patrician IV - GOLD Edition is $5.99, save 80 percent. • Football Manager 2012 is $8.99, save 70 percent. • X3: Gold is $8.50, save 66 percent. • Heroes of Might and Magic IV Complete Edition is $4.98, save 50 percent. • Binary Domain is $9.99, save 75 percent. • Batman: Arkham Asylum Game of the Year Edition is $9.99, save 50 percent. • The Lord of the Rings: War in the North is $4.99, save 75 percent. • Raven Squad: Operation Hidden Dagger is $3.74, save 75 percent. • Blood 2: The Chosen + Expansion is $2.99, save 50 percent. • Duke Nukem 3D Atomic Edition is $2.99, save 50 percent. • Divinity II: The Dragon Knight Saga is $9.99, save 75 percent. • Sword of the Stars Franchise Bundle is $9.99, save 75 percent. • Ascension: Chronicle of the Godslayer (iPhone) is $0.99, save 75 percent. • Angry Birds HD (iPad) is $0.99, save 67 percent. • Prey (Mac) is $2.99, save 80 percent. • Worms Special Edition (Mac) is $2.99, save 70 percent. • Alan Wake Franchise is $9.99, save 75 percent. • Sniper Elite Franchise Pack is $18.69, save 66 percent. • Anno 2070 is $32.49, save 35 percent. • Driver San Francisco Deluxe Edition is $22.74, save 35 percent. • Silent Hunter 5: Battle of the Atlantic Gold Edition is $16.24, save 35 percent.